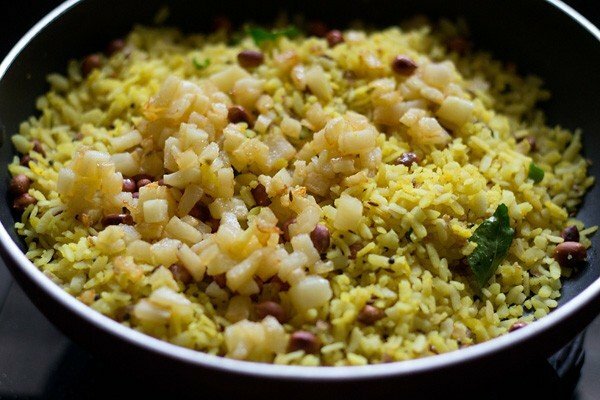 kanda batata poha recipe - easy to make recipe of poha or flattened rice with onions and potatoes. 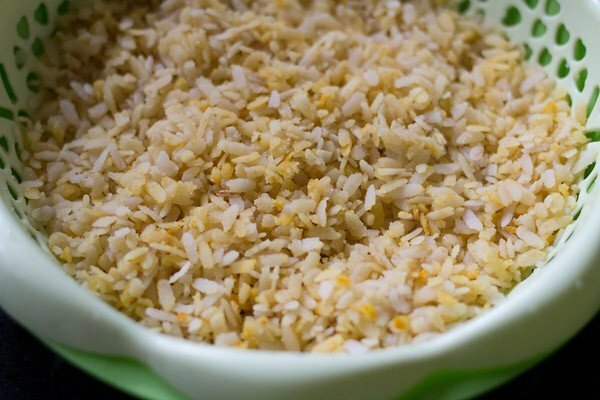 kanda batata poha recipe with step by step photos – kanda batata poha is one of the staple breakfast recipe from maharashtra made with onions (kanda), potato (batata) and flattened rice. 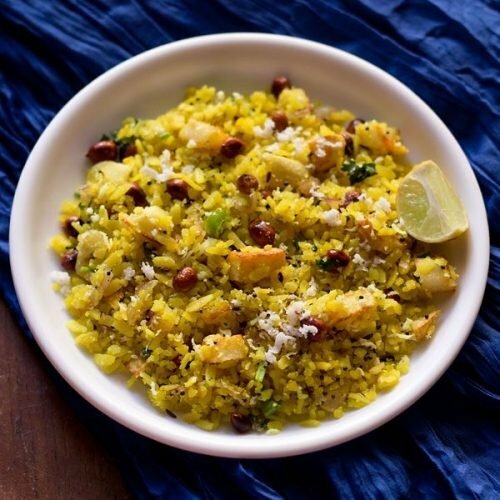 poha is an easy, quick and healthy option for breakfast or brunch or as a snack . 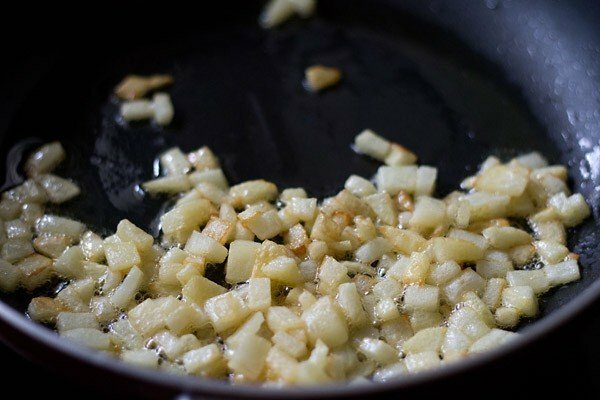 in this onion potato poha recipe like the way we usually do at home… i have sauteed the potatoes in oil but you can also boil them and then add to the poha. 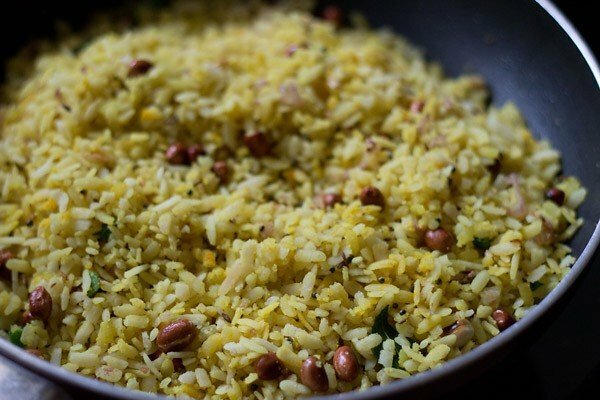 usually, i love to add roasted peanuts and top the poha with grated coconut… which adds a lot of flavor and makes it more healthy… and a cup of hot tea with it and i have my satisfied morning breakfast meal. 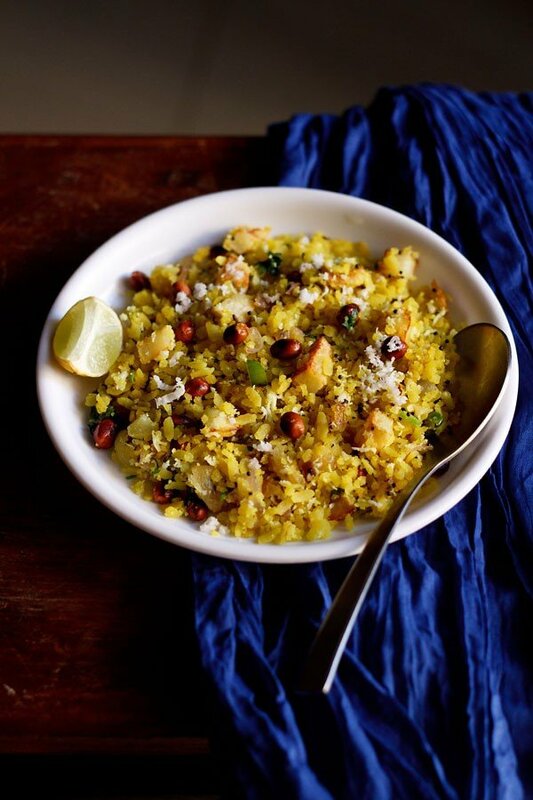 the best thing which i like about poha is that it is light on stomach and easy to digest and yet nutritious. 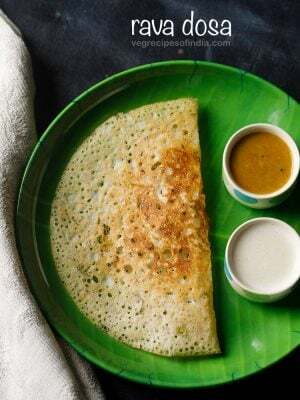 other recipes which you can make from poha are aval dosa, poha cutlet and poha chivda. pick the poha first. rinse the poha in clean running water in a strainer. 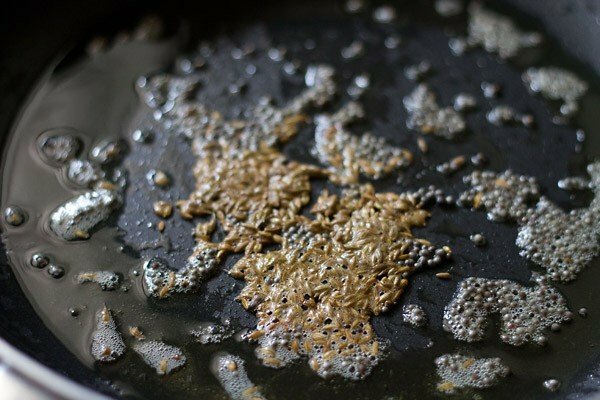 make sure that you do not rinse it too much or else it breaks and gets mushy. 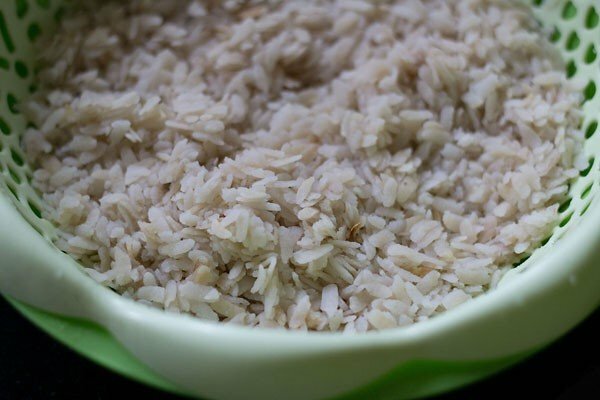 while rinsing, the poha absorbs enough water and it becomes soft. 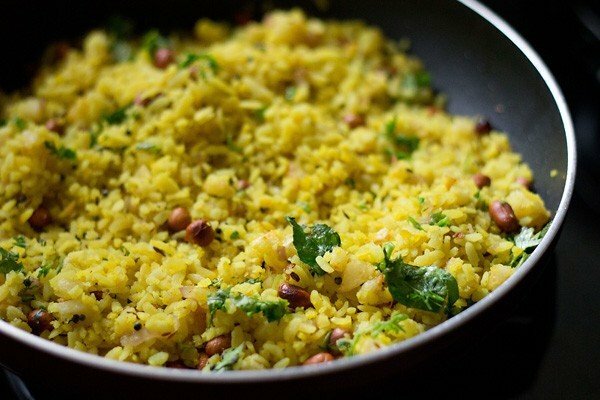 the poha must become soft but remain intact, whole and separate. if the poha does not become soft, sprinkle few drops of water on the poha in the strainer till they get softened. sprinkle the turmeric powder, sugar and salt in the poha. 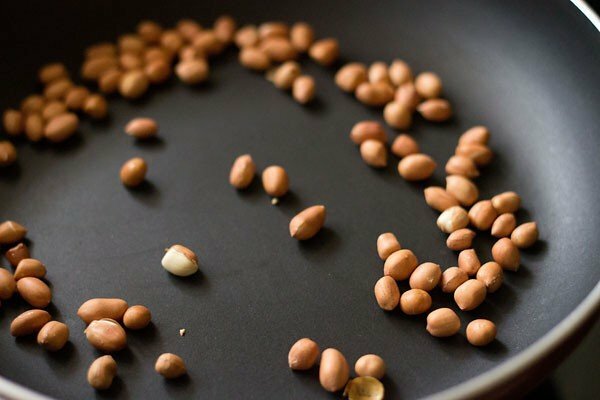 roast the peanuts in a small pan till they become crunchy and keep aside. also peel the potatoes and chop them into small cubes. in a kadai, heat oil. saute the potatoes in medium hot oil till light golden and crisp. keep aside. 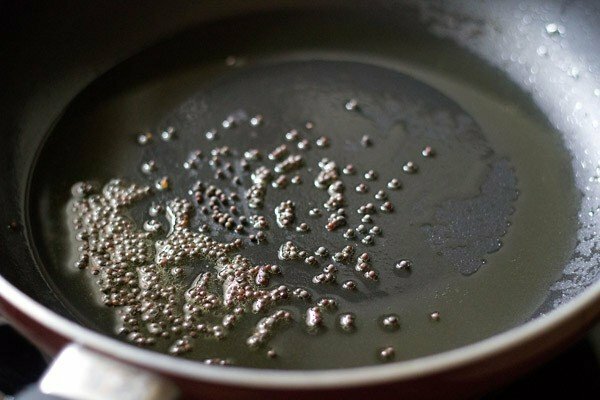 in the same kadai, add the mustard seeds to the hot oil. when they splutter, add the cumin seeds. When the cumin seeds sizzle, add the onions. saute the onions till they become translucent and soften. now add the curry leaves, green chili and roasted peanuts. saute for a minute. add the fried potatoes and then the poha. mix gently with the rest of the mixture. saute the entire poha mixture for 2-3 minutes on a low flame, stirring gently in between. taste the poha and if required add more salt and sugar. switch off the flame and cover the pan tightly with a lid for the poha to get steamed for a few minutes. remove the lid and garnish the poha with chopped coriander/cilantro leaves and grated fresh coconut. 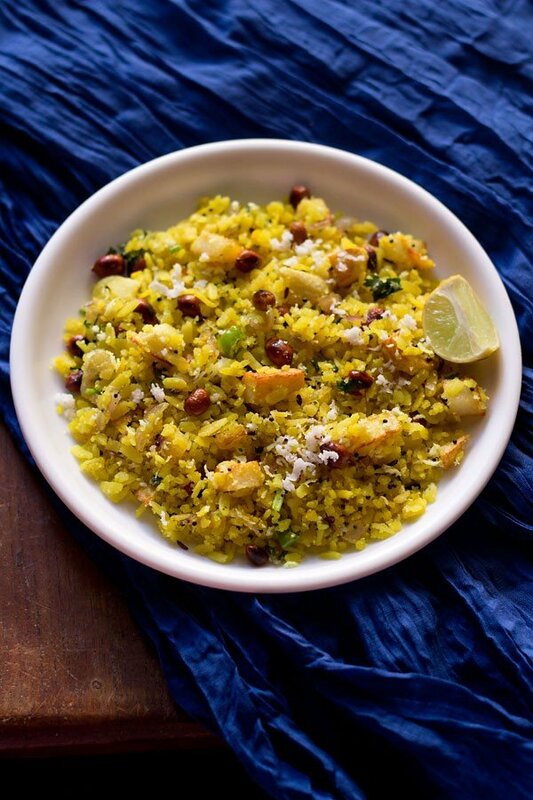 serve kanda batata poha hot with chopped lemon pieces. the lemon juice has to be squeezed on to the poha before eating it. alternatively, you could also do this method. once the poha is done, sprinkle approx 1 to 2 tsp lime juice on the kanda batata poha. mix it with the poha and then garnish it with coconut and cilantro leaves. adding sugar is optional. you can skip it completely if you don't prefer a slightly sweet taste in the kanda batata poha. 1. pick the poha first. rinse the poha in clean running water in a strainer or colander. make sure that you do not rinse it too much or else it breaks and gets mushy. while rinsing, the poha absorbs enough water and it becomes soft. 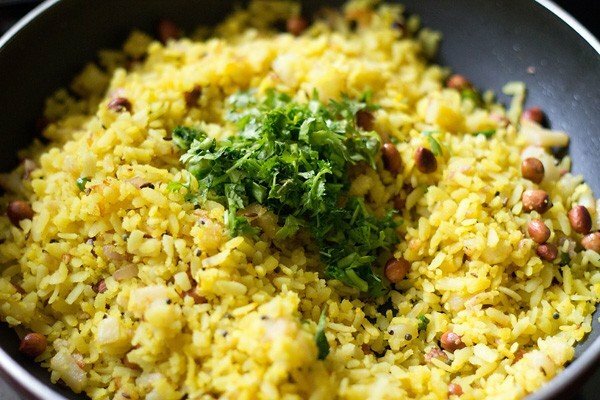 the poha must become soft but remain intact, whole and separate. if the poha does not become soft, sprinkle few drops of water on the poha in the strainer till they get softened. 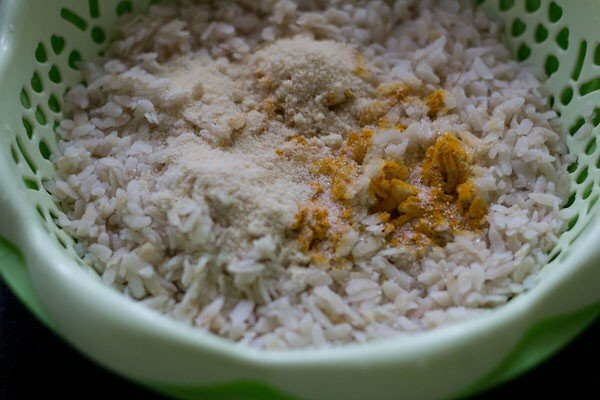 2. sprinkle the turmeric powder, sugar and salt in the poha. 3. gently mix with your hands. 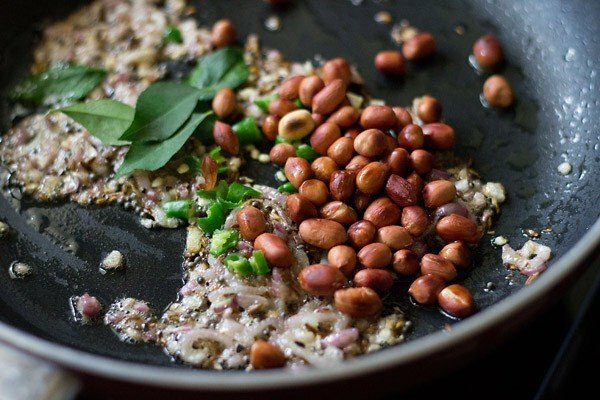 4. roast the peanuts in a small pan till they become crunchy. keep aside. 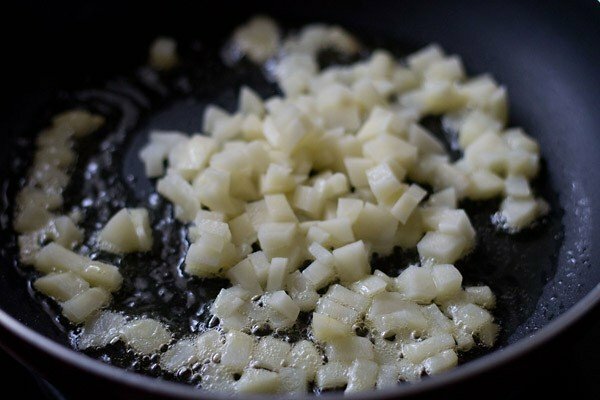 5. also peel the potatoes and chop them into small cubes. in a kadai or pan, heat oil. saute the potatoes in medium hot oil. 6. saute the potatoes till light golden and crisp. 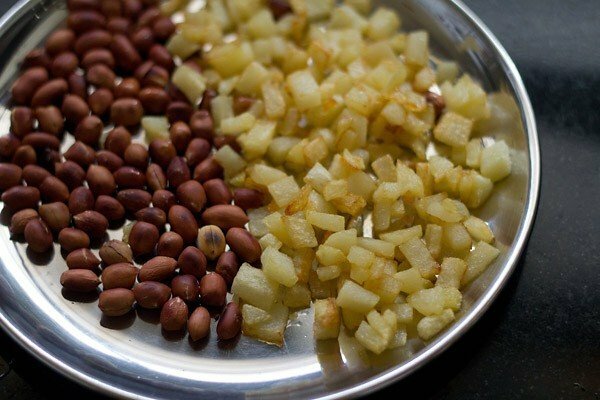 7. once the potatoes become light golden and crisp then remove them and keep aside with the roasted peanuts. 8. in the same kadai, add the mustard seeds/rai to the hot oil. 9. when they splutter, add the cumin seeds/jeera. 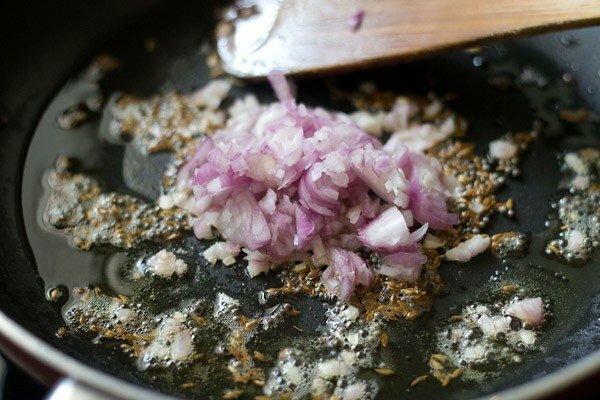 10. when the cumin seeds sizzle, add the onions. saute the onions till they become translucent and soften. 11. now add the curry leaves, green chili and roasted peanuts. saute for a minute. 13. mix gently with the rest of the mixture. 14. add the potatoes. saute the entire poha mixture for 2-3 minutes on a low flame, stirring gently in between. taste the poha and if required add more salt and sugar. switch off the flame and cover the pan tightly with a lid for the poha to get steamed for a few minutes. 15. remove the lid and garnish the poha with chopped coriander/cilantro leaves and grated fresh coconut. 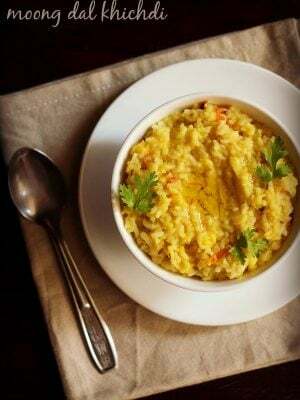 17. serve kanda batata poha hot with chopped lemon pieces. the lemon juice has to be squeezed on to the poha before eating it. alternatively, you could also do this method. once the poha is done, sprinkle approx 1 to 2 tsp lime juice on the kanda batata poha. mix it with the poha and then garnish it with coconut and cilantro leaves. Thanks for sharing the recipe. ….came out so well I am my self surprised. …big hug to you. thanks madhuri for sharing the feedback on poha recipe. 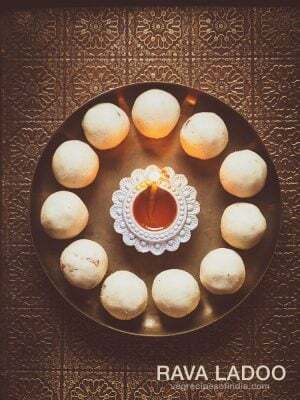 I have tried few of Ur recipes always turned out excellent, step by step instructions with picture are very helpful. Your doing a gr8 job. Thanks Shishira for your positive feedback on recipes. Nice to know this. 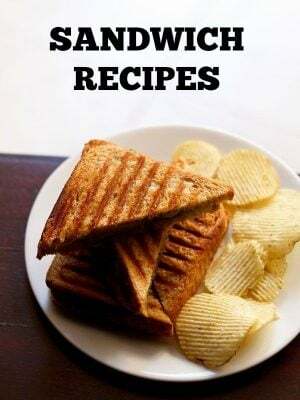 Tried this recipe today, it was excellent. This is my go to recipe for poha. thanks kanan. glad that the visuals are helping you. It was delicious Dassana! Tq! I am defeating my wife in cooking step by step by using your step by step guides. 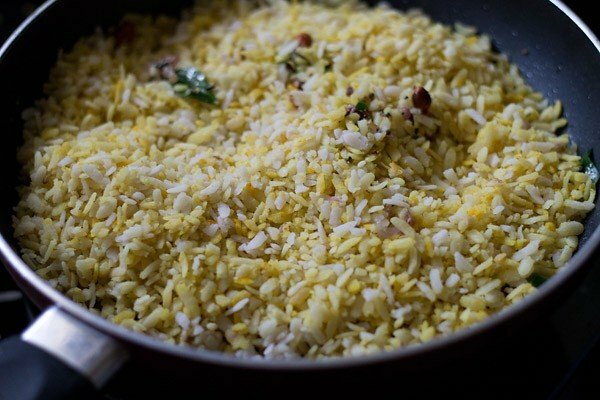 As my wife is out of town I am making poha every alternate day and taking it as breakfast, lunch and dinner as it’s easy to cook and it’s my favorite. Your method has added more flavors and taste to it. You have a superb collection. pleased to know this azim and thank you for your positive feedback 🙂 glad you can cook poha easily now and you are welcome. thank you dhruvi 🙂 surely try and wish you best of luck. 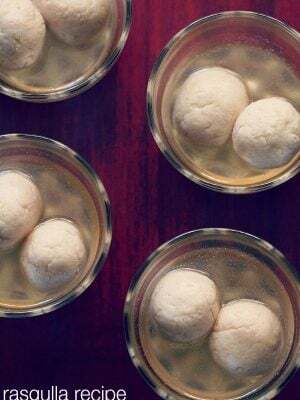 Thanks for sharing this recipe ..keep it up . Hi! loved your recipe, Dassana!